Today, after breakfast, I headed up the glacial moraine to check on the plans of the Taiwanese expedition, as they had ascended to assess conditions higher on the mountain. They apparently found poor snow conditions and decided to officially end their expedition and clean their equipment off of the mountain. One of the members of their expedition graciously offered to bring my Camp II equipment down to Camp I, knowing that I was still nursing injuries sustained on our last acclimatization cycle. The Taiwanese descended down to base camp the same day and I retrieved all of my equipment from Camp I and spent the afternoon drying tents and packing up my high mountain gear. 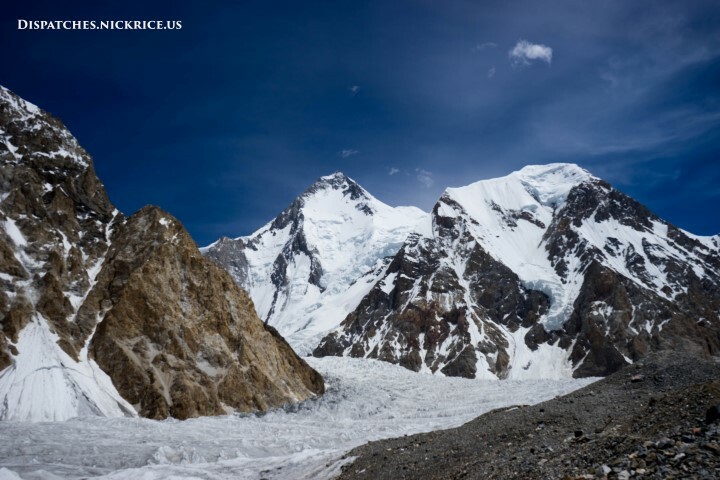 Later in the day, we received word that a Polish climber had descended suffering symptoms of high altitude pulmonary edema (HAPE) after climbing on Gasherbrum II. Having descended to base camp, his symptoms should hopefully resolve in the night. 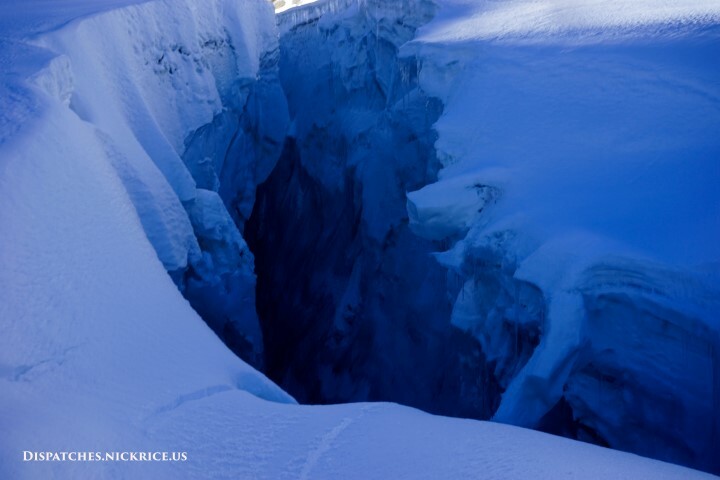 One of the massive crevasses we must cross in order to reach Camp I. The snow bridge visible on the right hand side of the photo is only safe to pass when the snow is hard (during a clear night with very low temperatures). 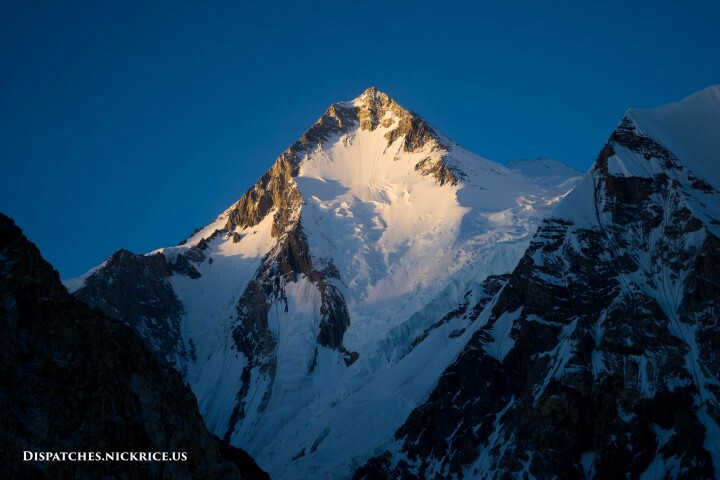 Today, I woke up at 7:30am and knew that the climbers still intending on attempting either Gasherbrum I or II had headed up in the night to higher camps. 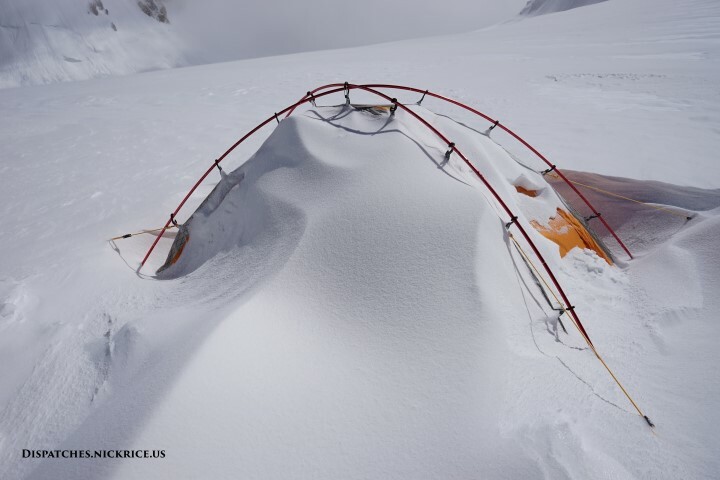 During the early hours of the morning, the weather was cloudy with some light rain/snow, which meant that the snow bridges that we use to cross the many crevasses enroute to Camp I and Camp II would be soft and much more dangerous, despite the early hour. I spent the day doing laundry and hoping that the climbers who headed up would be safe. 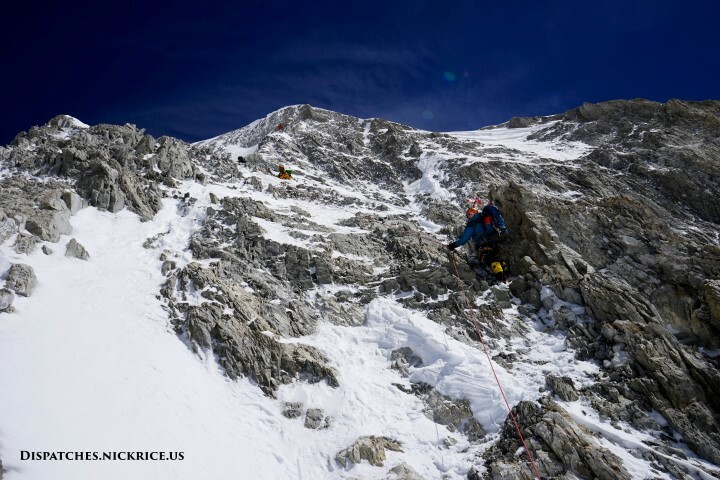 A few climbers came down later in the day, some with altitude sickness, and others due to poor climbing conditions. 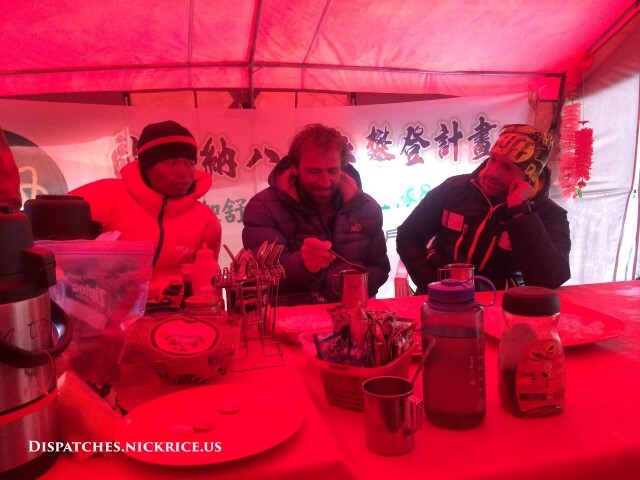 In the end, most likely due to heavy snow on the way to Camp I, the Taiwanese decided to remain in Camp I for the night and head up to Camp II tomorrow to see how conditions are there. 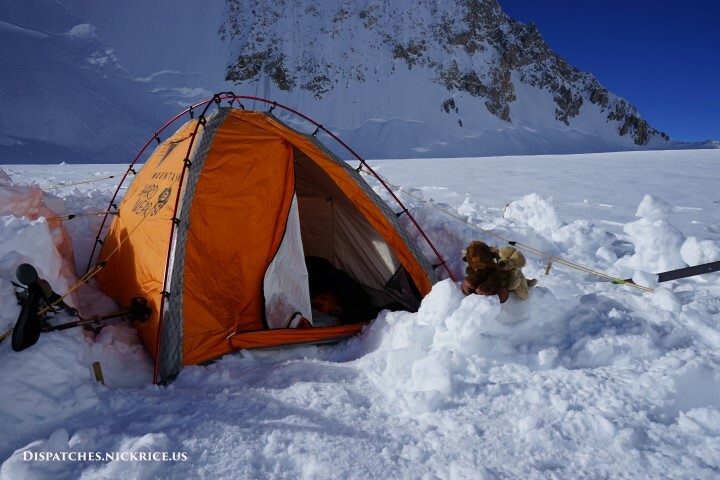 Today, I woke up around 7:30am to a snow-covered base camp, had breakfast and again headed up to Ferran’s camp to see about specific weather predictions. According to their forecast, we will have good weather on Thursday and Friday morning for a summit bid. This would mean that we must begin climbing tomorrow, aiming for either Camp I (if we intend to summit Friday) or Camp II (if we intend to summit Thursday). I began packing my things for the summit in the early afternoon and then received a visit from some Pakistani army officers who chatted with us for over an hour. Afterwards, I spoke with Martin (Czech) about his plans. 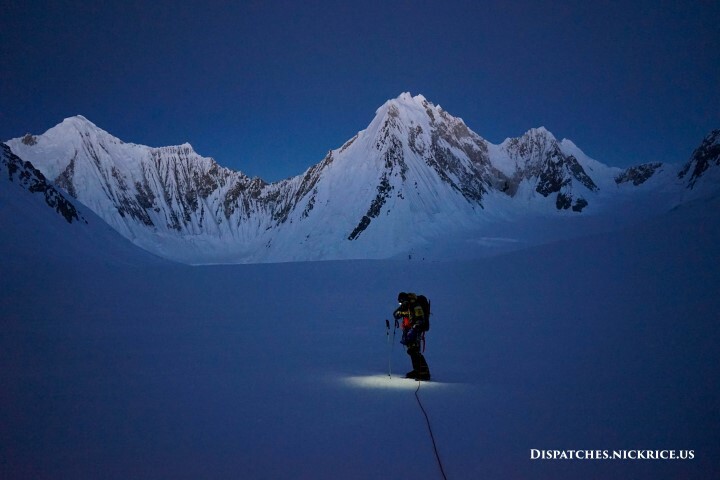 Just before dinner, we received the tragic news that an avalanche had struck climbers close to the deposit between base camp and Camp I on Broad Peak and that two climbers were severely injured and that one Pakistani HAP was missing. 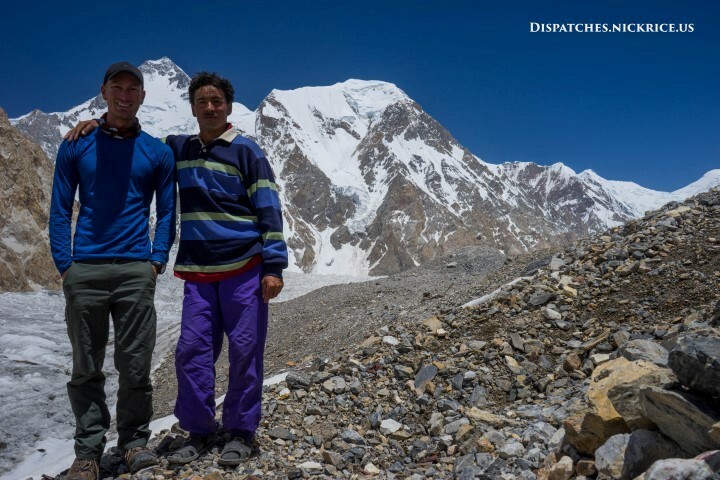 The missing Pakistani happened to be Qumbar, the brother of one of the local staff from the Slovenian Gasherbrum Expedition. The mood in base camp immediately became somber as some of the staff prepared to break the news to the kitchen boy about his brother’s fate. 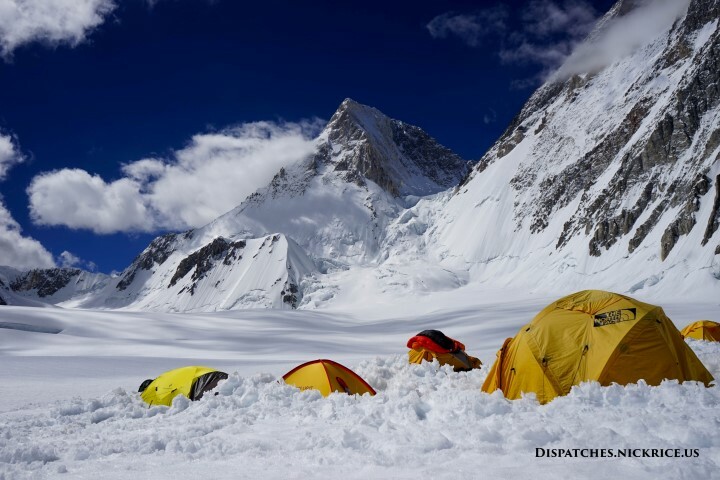 This incident immediately made me rethink my summit bid, as conditions on Broad Peak are quite similar to Gasherbrum I due to the close proximity of the two peaks. 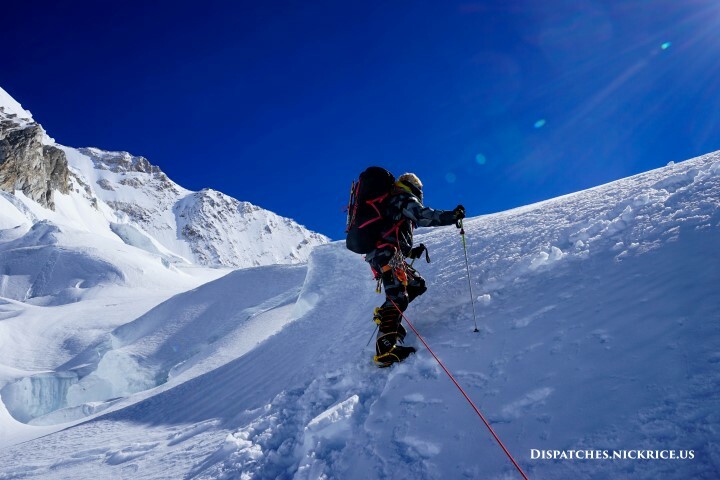 Having been jolted out of the delusional optimism that we sometimes feel before summit bids, I began to realize that conditions on Gasherbrum I this year are far from optimal for a summit bid. 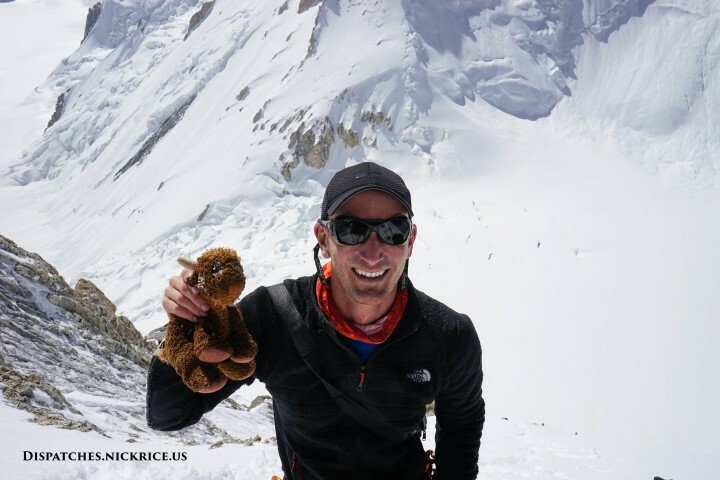 Just last week, Ferran and Yannick turned around from their summit bid on GI due to too much snow. By Thursday, we will have received another few feet of snow high on the mountain’s flanks. Additionally, weather before and after Thursday is forecast to be bad. If anything were to happen on our summit day that caused us to be delayed, we would be trapped in bad weather, making a rescue close to impossible. 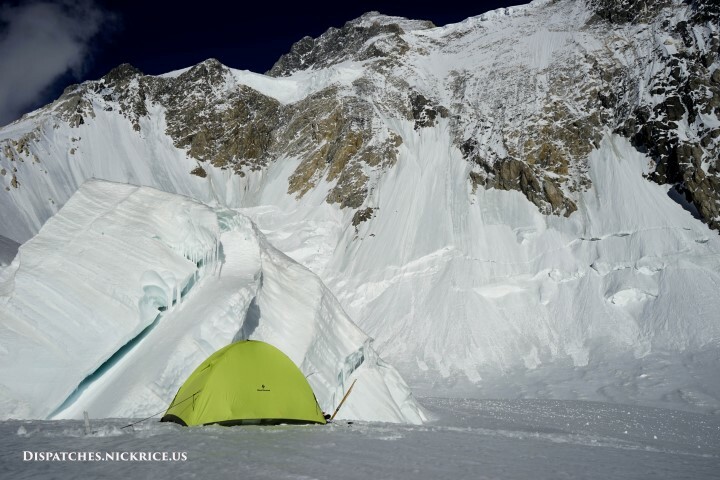 Lastly, the temperature at night is significantly warmer when it is cloudy/snowing vs when it is clear, resulting in softer snow bridges over the countless crevasses that riddle the route from Base Camp to Camp II. After taking into consideration all of these factors, in addition to the injuries that had built up from the start of the expedition (my ribs are still hurting from the fall I had when the piton snapped out on my descent from Camp III), I decided that it was too risky for me to attempt the summit and that I would go up only to clean off my gear from the mountain. After dinner, I went up to the Taiwanese camp to discuss their plans. They will go up in the night tonight to Camp II to assess conditions higher on the mountain. If they encounter too much snow, they will also clean their gear off and descend. It would seem that Gasherbrum I may be impossible this year. Perhaps one or two climbers might sneak up the peak and get off safely, however, I’m not willing to take the risk. 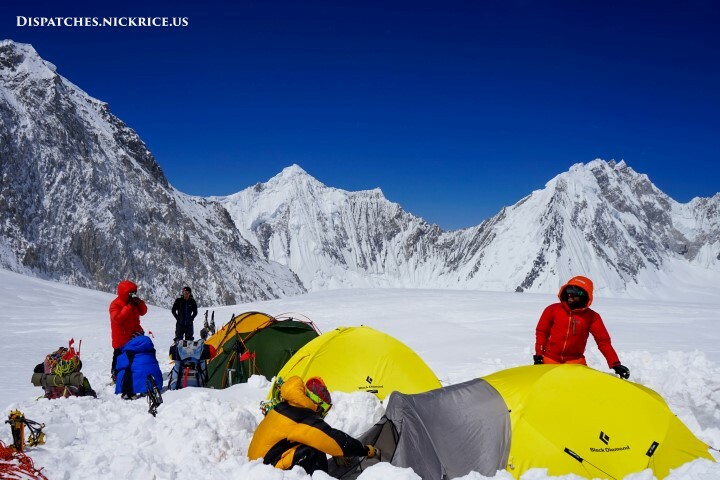 I’ve had a great expedition overall, having the opportunity to climb a new variation from Camp II to Camp III on Gasherbrum I, to make new friends from all over the world, and to take in some of the most breathtaking scenery in the world from high in the Karakorum. This mountain will be here for centuries and I don’t doubt that I will be back for another attempt. Today, after breakfast, I headed up to speak with the Taiwanese again about their forecast and plans, then made my way up to Ferran’s camp. He had received some generally good news about a potential weather window, but had not received specifics yet. I had lunch with Ferran, Tom, Yannick, and Sophie then chatted for a while as we waited anxiously for Kinga and her HAP to return to base camp from their successful summit bid on Gasherbrum II. 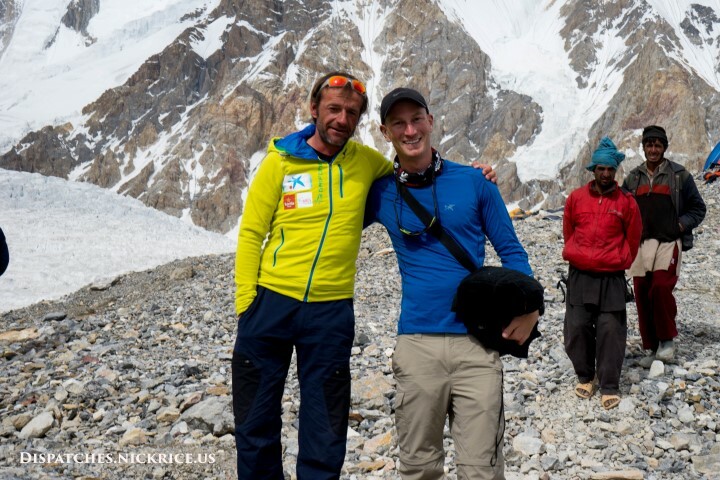 Once they arrived and settled back in to base camp, I congratulated them and headed back to my base camp feeling much more optimistic about our prospects on Gasherbrum I. Simone and much of his base camp decided to head home and will be starting the trek down early tomorrow morning. That leaves only Ferran, Yannick, Tom, their HAP, the Taiwanese team, their HAP’s, and myself on Gasherbrum I. Kinga has both permits but must decide if she is feeling up to a second 8000m summit bid after just getting off Gasherbrum II. I had dinner in the kitchen tent as it once again began snowing outside then got an early night. Today, I woke up at 2am in my nearly buried Camp II tent, prepared my backpack for the descent, and ventured out into the windy, cold night to join the Taiwanese for the decent to Camp I. I waited for close to 40 minutes outside while the other members prepared their things and finally around 3:40am, we began descending. We reached Camp I around dawn and I decided to go the rest of the way to Base Camp solo as my blisters required me to pace myself and I didn’t think it fair to impose that pace on others. 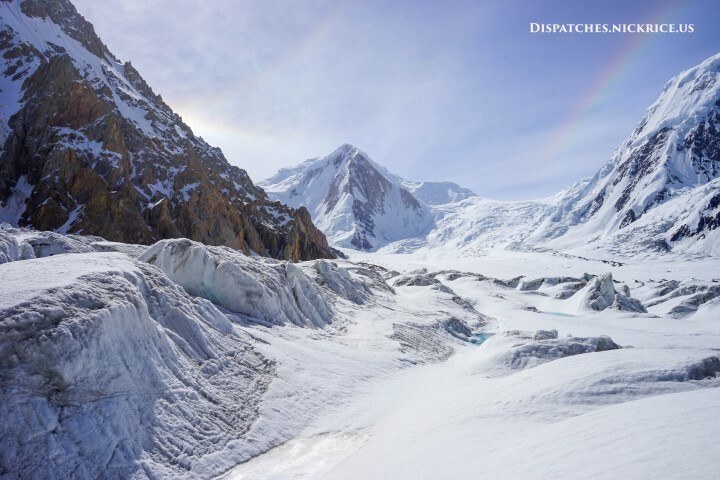 I spent 45 minutes unpacking equipment to leave in Camp I, then set off toward base camp. The sun warmed me as I passed over the glacier before plunging back into darkness as I continued through the ice fall. 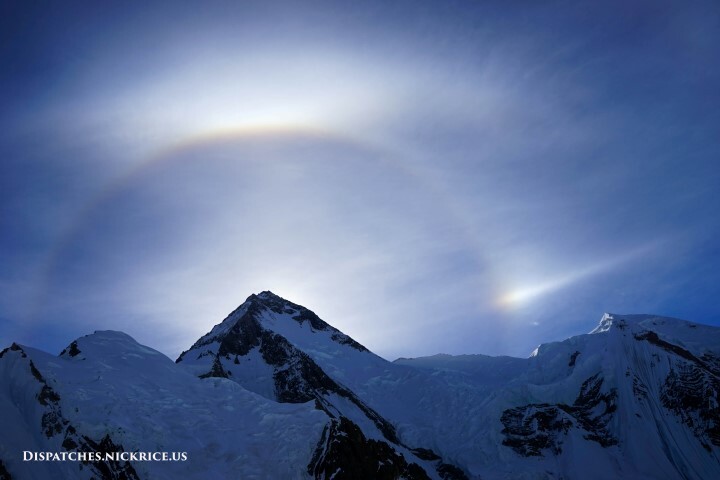 The sun made a halo around Gasherbrum I which eventually turned into three intersecting each other. This normally indicates moisture in the air (in the form of ice crystals) which causes the splitting of the colors that make up white light. I didn’t think it boded well for Ferran’s team’s summit push, but I hope they succeed. I arrived just after 8am to base camp and was greeted by Manzoor who had a drink for me and walked me back to our base camp. I quickly showered, had a Pakistani tea, and had a delicious hot breakfast. I finally took a close look at my feet and was horrified at the size and depth of the blisters that I had been ignoring higher up on the mountain. I did what I could with them and hope that they have time to heal before the summit window appears. 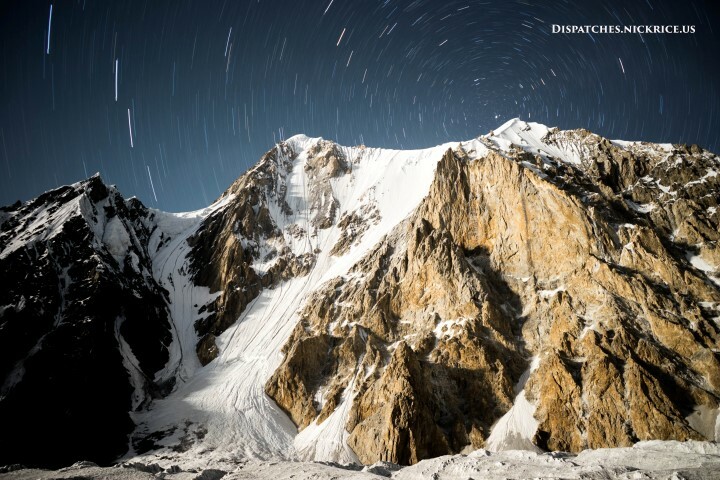 Muhammad (Pakistan), Nima (Nepal), and five members of the commercial expedition to Gasherbrum II summited yesterday after a harrowing 16 hours of climbing from Camp III. Others (including Kinga) will make an attempt today. Today, I woke up at 5:00am, had a small breakfast in my tent, made water, and finally braved the icy wind so that I could check on the plan. Ferran’s group, the Taiwanese, and I decided to leave Camp II at 8am or 9am, a decision I would quickly regret. As we made our way up the face, the wind quickly died down and the heat of the day made us regret our decision to climb in our down clothing. The deep snow did nothing to help the situation either. It ranged from knee deep to hip deep as we continued making our way up the face to the ridge that we hoped would join the final stretch of the Japanese Couloir leading to Camp III. 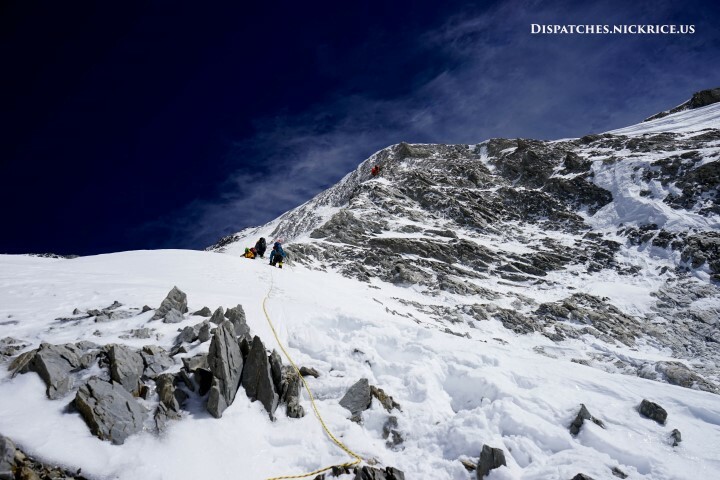 The combination of deep snow, the high temperature, and route finding made the climb to Camp III take far too long. After more than nine hours of climbing, and having reached an altitude of close to 7000m, I decided that I needed to begin descending if I was to have any hope for my own summit push. We all carried gear for Ferran’s team. I had a spool of fixed rope which I left secured to an anchor at my high point. I began descending the rocky ridge and when I reached the snowy slope, a piton flew out of the rock as I weighted it, sending me tumbling down the steep slope toward Camp II. Thanks to the warm afternoon temperature and deep snow, and the fact that I had stowed a trekking pole between my backpack and back, I quickly came to a stop, facing down the slope. I continued making my way down the slope slowly, double checking the anchors as I clipped into the rope. I reached Camp II after the sun had stopped warming the camp, and about an hour later, the Taiwanese arrived as well. I struggled to dry my soaked socks in the icy temperatures of my tent and after a couple hours, finally fell asleep. 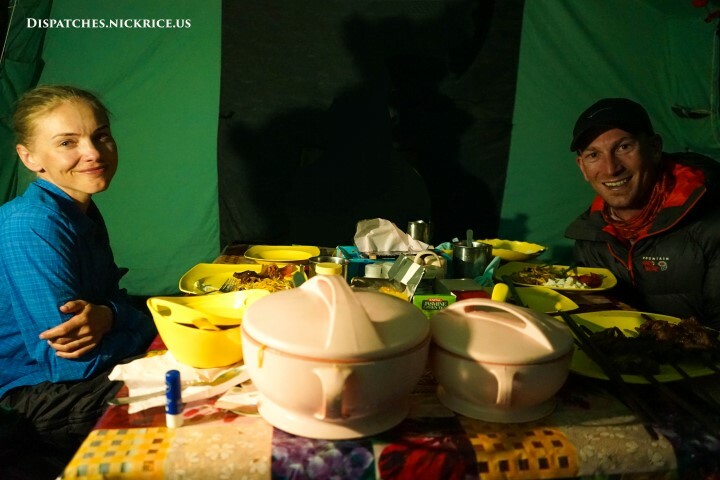 Today, I woke up at midnight, had breakfast with Akbar, prepared my equipment, and met Simone in his base camp. We got a late start but quickly made our way up the ice fall in the moonless, starry night. I had changed my inner boots before this carry, as they were supposed to be much warmer and lighter than those I’d been using, and this quickly proved to be a mistake as we made our way through deep snow that wasn’t nearly as hard as we were expecting. I quickly began developing blisters on both of the arches of my feet and the climb to Camp I was incredibly painful. Once in Camp I, Ferran gave me 120m of fixed rope to carry in addition to my down clothing, sleeping bag, camp III tent, stove, gas, and food. My backpack was close to 30kg as I set out for Camp II in the heat of the day. I struggled to keep up with Simone as my feet became increasingly painful, and at the base of the ice fall en route to Camp II, I decided that it would be wise to camp here and continue to Camp II when the snow was in better condition and the temperature was cooler. Simone and his high altitude porter continued the last three hours to Camp II while I set up my tent and made water to wait out the heat of the afternoon. The evening brought strong wind that blew spindrift everywhere. I went to sleep after the sun set hoping that the wind would die down before my early morning departure for Camp II. Today, I woke up to a clear morning and spent the day preparing my equipment for a carry to Camp III with the possibility of a summit push. Although the weather window looks like it could be long enough for a summit push, it would have to be stellar for me to push myself physically to carry and fix the route to Camp III then summit. Based on the degree to which it has been fluctuating, I very much doubt this will be it.